Below, please find our Frequently Asked Questions (FAQ) for Homeowners, Builders, and Realtors/Brokers. If you do not see your question below, please feel free to contact us directly. How do I obtain a plaque for my historic home? If your home was built before 1915, please visit our historic home plaque project page for more information. The process is relatively simple and approval generally comes within a month or two. I am concerned about the structural integrity of a historic structure or place; whom should I contact? Thank you for being vigilant with respect to the Town's historic assets. Please contact our Chairman and provide us with details on the matter. When does the Historical Commission meet? The Commission generally meets on the second Tuesday of each month at 7:00PM. Our meetings are typically held in the Wellesley Town Hall or Wellesley Free Library. Please check this page for our next meeting date, time and location. The meetings are held pursuant to the Open Meeting Law and citizens are invited to speak at the beginning of each meeting. What is the difference between the Historical Commission and Historical Society? The Commission is a department of the Town government charged with advocating for the protection of the Town's historic assets. The Commission meets monthly, often in the Great Hall of the historic Town Hall building. The Society is a private, nonprofit 501(c)(3) organization funded by membership dues, grants and fundraising. The Society is located at 229 Washington Street, Wellesley. What is the difference between the Historical Commission and Historic District Commission? The Historical Commission is a department of the Town government charged with advocating for the protection of the Town's historic assets, whereas the Historic District Commission, also a department of the Town government, is strictly responsible for overseeing both the single building and multiple building historic districts in the Town. The two commissions work closely together during the planning and creation phases of a historic district. Do I need permission from the Town to modify or demolish my house? It depends. If you live in a Historic District (multiple building or single building) or a Neighborhood Conservation District, you must seek approval from the district. Please contact the Town of Wellesley Planning Department, which can provide information about the application process. If you do not live in such a district, you probably do not need any approvals outside of the standard Town permitting process. I would like to construct a house that is in keeping with the character and history of the neighborhood; whom should I consult? Please contact the Historical Commission's historic home researcher who would be glad to assist you in researching the history of the neighborhood and its homes. If the lot on which you wish to construct the house is in a Historic District or Neighborhood Conservation District, please contact the Town of Wellesley Planning Department. What should I tell prospective buyers of a home that has a Historical Commission plaque? 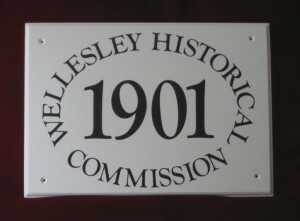 Historical Commission plaques are purchased by homeowners that qualify under the current guidelines. The fact that a house has a plaque does not mean that it cannot be modified or even demolished. Because the homeowner owns the plaque, they (and any future purchaser) is free to remove it from the house if they wish. If a house that previously had a plaque is significantly altered so as to materially change the historic nature of the exterior of the house, the Historical Commission may ask that the plaque be removed from the exterior of the house. You may also direct prospective purchasers to our page on historic home plaques. Can I advertise the fact that a home has a Historical Commission plaque? Absolutely! Provided that such advertising is consistent with your brokerage's practices and applicable laws, the fact that a home has a plaque is undoubtedly an appealing characteristic to many potential buyers. What should I tell prospective buyers of a home located in a Historic District or in a Neighborhood Conservation District? That these homes belong to a place or neighborhood in the Town that is recognized as having, in the case of a Historic District, distinctive building characteristics and places of significant history, or, in the case of a Neighborhood Conservation District, irreplaceable neighborhood character. Each type of District limits home modification and demolition with rules unique to each place or neighborhood. The Town of Wellesley Planning Department can provide additional information about the permitting process in those Districts.